Old Pochmann is a basic method for blind solving that utilizes swapping only a few pieces at once using common algorithms found in methods like CFOP. It was created by Stefan Pochmann. You set up corners to a receiving spot and swap it with the bank piece. I highly suggest learning this before going into M2 method for edges. Done between corners and edges if an odd number of letters were in both sets. Instead of memorizing pieces like UB for Up/Back edge or FR for Front/Right I give a letter to each piece which makes it really easy to memorize each piece. The letters are A-X starting on the U face going clockwise, then Front, Right, Back, Left, and Down face. It may take some time to get used to where each letter is but in time it becomes easy to recall each piece. All of these set up moves must be reversed after the algorithm is done before the next piece is moved. For each piece you will set it up, do a Y permutation, and then reverse the set up moves. a (T) after the set up move signifies a T perm and (J) ​ for J perm done between set up and reversing set up. M2 is a method also created by Stefan Pochmann that is very similar to O.P. in a sense that it only swaps one piece at a time. The set up moves are a bit more difficult and there are a couple special algorithms to know. The basic idea of it though is that instead of doing T and J perms you just do M2. Every time you switch an edge the middle slice turns 180°. Because of this the C/E piece switches spots with the O/W piece. You need to know if in your cycle of letters if it is an odd number (First, third, fifth, etc. in the line of letters) or if it is even (second, fourth, etc.). 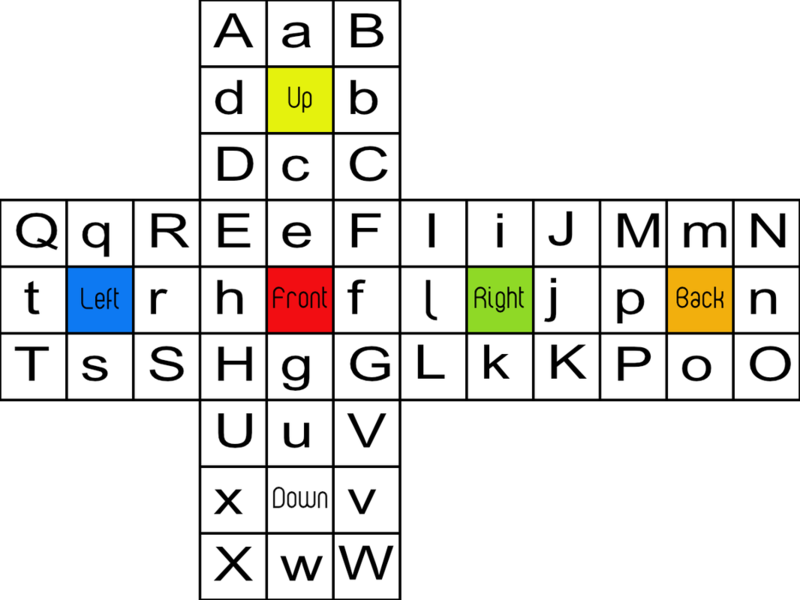 I memorize letters is groups of two so you can just look at if it is the first or second letter. If it is the first letter you do alg. 1 for C/E and alg. 2 for O/W. If it is an even letter you just flip them and do Alg. 2 for C/E and Alg 1 for O/W. The algorithms are just reverse of each other so if your first two letters are C and then W you would do (U2 M' U2 M') and the again (U2 M' U2 M') since you did alg. 1 for C and then alg. 1 again for W. It may seem confusing at first and I originally tried to find a way around t by flipping edges back at the end but after a couple solves it becomes pretty easy. Often you will have edges and corners that just need to be flipped or twisted. If you don't solve them in the way shown in the Old Pochmann walkthrough (orienting the Front/Left edge by solving H then R then you can solve them by just doing a simple algorithm. The few algorithms shows are made to have the corners or edges that need to be oriented to be set up in those spots. If you have an even number of edges flipped they will be the only ones oriented incorrectly. If you have an odd number (1, 3, etc.) you will also have the bank piece flipped incorrectly. If you have only one corner oriented incorrectly the bank piece will be also incorrectly oriented. If you have one corner that needs to be twisted clockwise (120°) the bank will need to be twisted counter-clockwise (120°). Having two incorrectly oriented corners does not mean that the bank will be correct since you could have both corners needing to be twisted the same direction 120°. There are a ton of options and variations but these are a few of my favorites. You do NOT need to know these but they can help reduce the moves done in a solve and inevitably lower your times.